Many of us celebrate Christmas alone. This may be the first time for us, or an odd set of circumstances this year, or an every year thing. Some of us are single persons living along. Some of us are widows or widowers and some of us are separated or divorced. Quite a few of us have family living elsewhere. It may be that our health or the weather prevents us from even going to church on Christmas. Perhaps we are able to celebrate with a faith community on Christmas eve or Christmas morning, but the rest of the day is alone, and accompanied only with memories. Some of us are in nursing homes, and though surrounded by neighbors and friends, we have no one to visit us on this special day. Some of us are in a distant land on business. For us who are alone, Christmas can be a great blessing. The solitude we have can offer us the grace to receive the gift of Christ's coming in a very special way. We may be tempted to be discouraged or quite down in our aloneness, but that really is a temptation. It is a temptation to turn our focus in on ourselves rather that to let ourselves be contemplative at the time of Christmas. To act against this temptation is to open ourselves to great graces these days. The first grace we might have is time. These are special days to take advantage of the stories that are given us about Zechariah and Elizabeth, Joseph and Mary, the journey to Bethlehem, that frightening night looking for a place to stay, the birth in a stable, the visit of the shepherds, the visit of the Magi, the flight into Egypt and the hidden life of the Holy Family back in Nazareth. When we have time, we can read those stories and let them enter our imagination. We can contemplate them deeply by entering the scenes - even becoming an added character in the stories to become part of the dialogue and to experience it all "first hand." We can take the time to pay attention to the sounds and smells, to see what everyone is wearing and what they are saying. We can study people's faces and the emotions and prayers of the characters enter into our hearts. 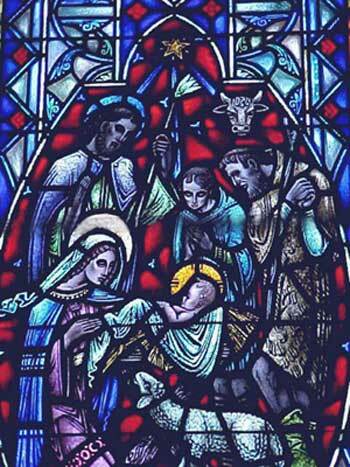 Seeing a Christmas card, a crib scene or a stained glass window is a doorway to really entering the scene and witnessing the birth, holding the child, comforting Mary and Joseph, being a part of the excitement of the shepherds, rejoicing in a hidden life with the Holy Family. The second great grace we might be given is the ability to enter into relationships with these special persons in the story of our salvation. It would be a special grace if our aloneness at Christmas could allow us to come closer to Mary. Mary is both the mother of our Savior and the first disciple. In those roles, she is always our first Intercessor. 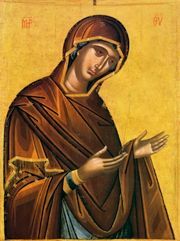 It can be a very rich time of prayer to simply talk with Mary - telling her our situation, describing our situation, and then listening to her tell us the story, her story and ours. Somehow, as she tells us about her surrender to God's will, about the anxiety and trust of that night, about the poverty of the stable and they joy in her heart at how her son brought such joy to the shepherds, we can be filled with consolation. The mystery of God's redeeming mercy and love which was born in that stable that night can be born in our stable. It can be very powerful to turn to Mary and simply ask her to intercede for us, for our loved ones, and for our world. In our solitude, we can become great instruments of God's grace for others - transforming our aloneness into a powerful ministry of love and mercy. We get our word "manger" from the Latin (and so French, Italian, Spanish) root, which means simply "to eat." Jesus comes, into the greatest place of our poverty, not only to be "with us" but to nourish us. The manger can be the place we go this Christmas to be fed with the acceptance, love, and peace we need. There is no place of darkness in which we need ever feel alone. There is no situation, no loss, no tragedy that need ever leave us empty. There is no sin, no matter how selfish that will ever leave us apart from God's love. Perhaps the greatest grace of our aloneness will be the gift of grateful surrender. Sometimes, our aloneness gets filled with resentment, self-pity and anger. We can become upset about everyone and everything. These emotions can be like a cancer that eats away at us and wipes out any chance of peace and joy entering our hearts. When these emotions dominate our hearts, our whole being is tight and closed. 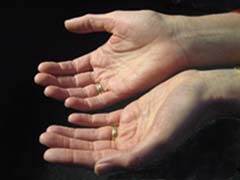 Our hands symbolize the emotions within us: holding on to everything tightly, shaking a finger at others, pounding the table as we refuse to accept this or that, perhaps throwing things down, slamming doors, maybe even wanting to slap someone. It is into these powerful emotions that we can let our Savior come with the gift of mercy and peace. Maybe we can celebrate the Sacrament of Reconciliation this week and taste how patient, compassionate and forgiving he is to us. Perhaps we may only be able to examine our consciences humbly and make and act of contrition. When we accept who we are and where we are, just as we are accepted and embraced there, the anger and self-absorption will melt. Then we can open our hearts and our hands in surrender. "I am your servant today, Lord. Let this be done in me according to your will." Gratitude is the greatest grace of Christmas. We can receive that grace alone. And, sitting alone, with our hands open, whether for a minute or an hour, can prepare us for the greatest experience of Christmas ever. And then, so full of grace, we can begin to reflect on how we can share our gifts with others.